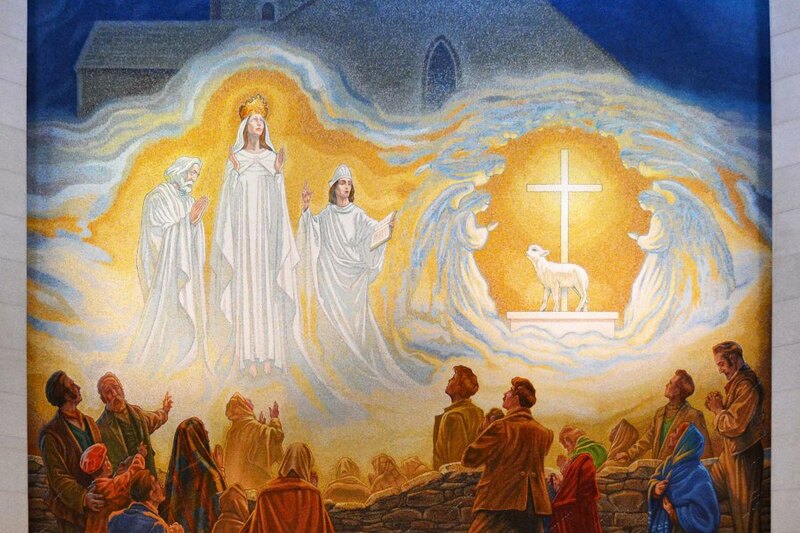 The apparition in County Mayo in Ireland of Our Lady of Knock is reported to have occurred on the evening of August 21, 1879, the vigil of the octave of the feast of the Assumption. Those who witnessed the miracle ranged in age from five years old to seventy-five. The apparition was described as follows: “Our Lady was wearing a large, brilliant crown and clothed in white garments. On her right was Saint Joseph, his head inclined toward her and on her left Saint John the Evangelist. To the left of Saint John was an altar on which stood a cross and a lamb.” Standing only a few feet off the ground, the Blessed Virgin wore a white cloak and was described by witnesses as being incredibly beautiful. She wore a bright golden crown, and appeared to be praying with her eyes looking toward heaven with her arms bend in front of her with her palms facing inward. Fifteen parishioners stood to witness the apparition for two hours as they recited the rosary. Although it was daylight when the apparition began, the weather turned for the worse and it began to rain heavily. The area around the apparition appeared unaffected, however, as the ground remained dry as long as the vision lasted. She did not speak, but the gable of the church where the manifestation was made was covered with a cloud of light. Saint Joseph, the foster-father of Jesus, also wore white robes and stood on the Virgin’s right. He inclined his head respectfully toward the Blessed Virgin. Saint John the Evangelist wore a mitre, and appeared to be preaching as he held a book in his left hand. Since then thousands of people have gone to Knock to pray to Our Lady. Their prayerful, penitential and reverential spirit has been commended again and again by visitors from other lands. No sign of commercialism detracts from the purely religious atmosphere of that hallowed spot. People from all walks of life kneel in humble supplication before the shrine of Our Lady, fully confident that she has sanctified that spot by her apparition. Organized pilgrimages from various dioceses are conducted frequently to the shrine of Our Lady of Knock. The rosary comprises the main portion of the devotion; the shrine is therefore appropriately called the Rosary Shrine. The “Knock Shrine Annual” relates many interesting stories of cures and conversions effected at the shrine. Our Lady of Knock , Queen of Ireland, you gave hope to your people in a time of distress and comforted them in sorrow. You have inspired countless pilgrims to pray with confidence to your divine Son, remembering His promise, “Ask and you shall receive, seek and you shall find”. Help me to remember that we are all pilgrims on the road to Heaven. Fill me with love and concern for my brothers and sisters in Christ, especially those who live with me. Comfort me when I am sick, lonely or depressed. Teach me how to take part ever more reverently in the Holy Mass. Give me a greater love of Jesus in the Blessed Sacrament. Pray for me now and at the end of my death. Amen. In the name of the Father, and of the Son, and of the Holy Spirit, Amen. Give praise to the Father Almighty, To His Son, Jesus Christ the Lord, To the Spirit who lives in our hearts, both now and forever. Amen. Our Lady of Knock, Queen of Ireland, you gave hope to your people in a time of distress, and comforted them in sorrow. You have inspired countless pilgrims to pray with confidence to your divine Son, remembering His promise, “Ask and you shall receive, seek and you shall find.” Help me to remember that we are all pilgrims on the road to heaven. Fill me with love and concern for my brothers and sisters in Christ, especially those who live with me. Comfort me when I am sick, lonely or depressed. Teach me how to take part ever more reverently in the Holy Mass. Give me a greater love of Jesus in the Blessed Sacrament. Pray for me now, and at the hour of my death. Amen. Lamb of God, you take away the sins of the world; Have mercy on us. Lamb of God, you take away the sins of the world; Have mercy on us. Lamb of God, you take away the sins of the world; Grant us peace. ST. JOSEPH, Chosen by God to be The Husband of Mary, The Protector of the Holy Family, The Guardian of the Church. Protect all families In their work and recreation And Guard us on our journey through life. (Repeat – Lamb of God, etc.) ST. JOHN, Beloved Disciple of the Lord, Faithful priest. Teacher of the Word of God. Help us to hunger for the Word. To be loyal to the Mass And to love one another. (Repeat – Lamb of God, etc.) Our Lady of Knock Pray for Us Refuge of Sinners Pray for Us Queen Assumed into Heaven Pray for Us Queen of the Rosary Pray for Us Mother of Nazareth Pray for Us Queen of Virgins Pray for Us Help of Christians Pray for Us Health of the Sick Pray for Us Queen of Peace Pray for Us Our Lady, Queen and Mother Pray for Us Our Lady, Mother of the Church Pray for Us (Here mention your own special intentions) With the Angels and Saints let us pray: Give praise to the Father Almighty, To His Son, Jesus Christ the Lord, To the Spirit who lives in our hearts, Both now and forever. Amen. Instruction: The Rosary or Mass and Holy Communion is recommended each day.